Once again cast in the companionable style of journal entries and notes that readers enjoyed in Lueders’s 1977 creative nonfiction classic The Clam Lake Papers, this new investigation into language and ways of knowing follows the author’s move from the north woods of Wisconsin to the Intermountain West of Utah. The Salt Lake Papers is divided into two sections by location and time. Book One reflects the central geophysical presence of the Great Salt Lake, in view from Leuders’s home and the University of Utah campus where he studied and taught. Researched and composed during the 1980s, it is published here for the first time. Book Two begins with his retirement to the “earthscapes” of the Torrey–Capitol Reef area of southern Utah and contemplates the Colorado River system. Hydrology thus provides both the physical and the metaphysical basis for the author’s reflective insights and for the natural flow of his advancing thought. Beautifully written, The Salt Lake Papers, in varied ways, speaks to the necessity of the humanities in the modern age. At its heart, Lueders’s small book of intellectual musings explores place and the ways landscape shapes what is observant in each of us. Edward Lueders is a jazz pianist, WWII veteran, poet and retired professor from the University of Utah. He is the author of The Clam Lake Papers: A Winter in the North Woods and The Wake of the General Bliss: A Novel of World War II, and the editor of several volumes, including Writing Natural History: Dialogues with Authors. 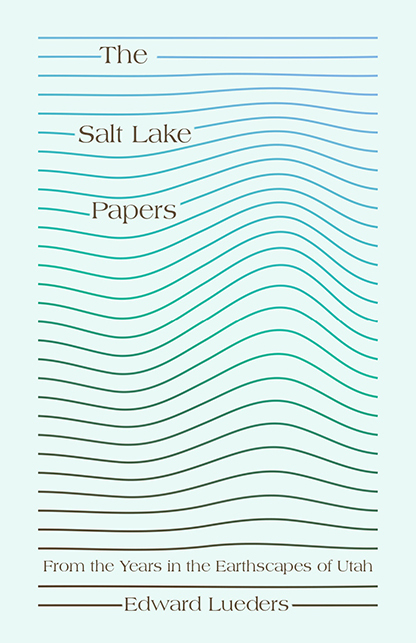 "Where memoir meets natural history, where aphorism joins with tale, where one man’s memory is indivisible from one man’s intellectual discovery—that’s the magic and forceful fact of The Salt Lake Papers. I remember exploring Clam Lake with Edward Lueders, nearly forty years ago, as he mapped the Wisconsin of his imagination. Now, belated and timely, playful, meditative, and brilliant, he rejoins a lineage leading down from the great Montaigne, through Franklin and Thoreau, to Bass and Tempest Williams to today. Is it a daybook, is it a poem, a political almanac, a geological map? Edward Lueders’ new book, like his spirit, is a gift." "Edward Lueders's oracular meditation, informed by nine decades of intense observation, takes his readers on a profound journey through the intersections of mind and matter, nature and culture, humanities and science. The clarity and conundrums inspired by Utah's red rock beauty form the backdrop to a singular human story with resounding collective echoes."